Originally $9 Now $4.95! 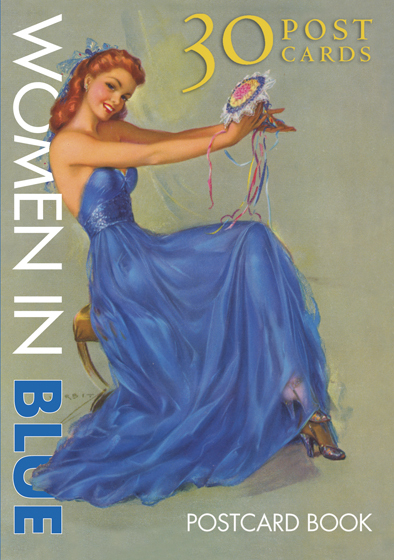 In keeping with blue's complexity, we've selected a wide range of images of women clad in blue for this collection of postcards. Pin-up girls and Pre-Raphaelite maidens share these pages with women advertising stockings and orange soda. They all wear blue, in all its glory. Few colors have as paradoxical associations as blue. It evokes positive qualities such as serenity, happiness, and purity, yet feeling blue is a euphemism for sadness. Blue is masculine yet pretty, dreary and cheerful. The blues is both a state of mind and genre of music that for all its stark sadness evokes profound joy. A person can be a blueblood, a bluestocking, a bluenose, and true blue without conflict or redundancy. Blue is all around us, the color of sunny days and the most inviting seas, yet is also uncommon in nature. Periwinkle, navy, ultramarine, cobalt, baby, sky, slate, cerulean, indigo, azure, sapphire, royal, robin's egg, cornflower, turquoise and Prussian: what color commands the range of shades that blue does?